Updated Wednesday March 6, 2019 by WRA Editor. Attention Coaches: The Coaching Manual has been revised for the 2019 outdoor season. Click here to download the Coaching Manual. WELCOME TO WRA FIELD HOCKEY! 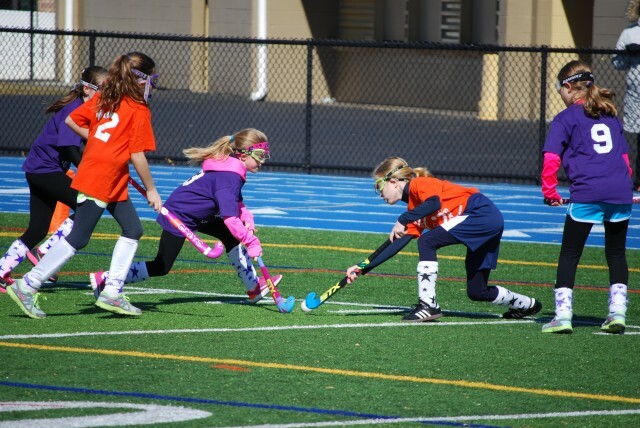 The WRA Field Hockey Program has been teaching the fundamentals of Field Hockey since 1996. Our coaching philosophy is "to teach the game of field hockey in a fun environment and to work on child development in sportsmanship, fair play, teamwork and competition." This is a Developmental Program for children in grades 1 through 11, focusing on basic field hockey skills. We welcome new players in every age group. The WRA Field Hockey Program provides a fun introduction to the game, giving kids the chance to learn fundamentals and rules of field hockey. As of 2012, all practices and games for the outdoor season will be played on artificial turf fields at Wissahickon High School (WHS) and Germantown Academy (GA). Registration for the Spring Outdoor season will be in January and February 2019. Registration usually fills up quickly, so please make sure you register early. Once we reach capacity in each of the divisions, we CANNOT add more players, and registration will close for that division. If any division does not reach capacity by the close of registration, a late fee of $25 will apply to the base registration fee. To register for any of our programs, you must have an account with www.wrasports.org and MUST have the grade field properly completed. Players are not allowed to play up a division without prior approval from the field hockey committee. Players need to bring: Hockey stick, mouth guard, shin guards, and protective eyewear/goggles. Players in all age divisions will be required to wear NFHS approved goggles for outdoor field hockey. The Spring Outdoor season has weeknight practices for the Junior, Intermediate, and Senior divisions. Practices are held one night a week from Monday through Thursday at GA on the Sisters’ (Jordan) Fields. A map of the practice fields is available on the website. There are no weeknight practices for the Instructional Outdoor Program. The Spring Outdoor Program has Sunday afternoon practices for the Instructional Division from approximately 12pm - 2pm and games for Junior and Intermediate Divisions at the WHS Stadium from approximately 2pm - 5pm. Sunday games for the Senior Division will be at GA Sisters' (Jordan) Fields at 12 noon or 1 pm. The start of each season will differ slightly each year based on weather, field availability and the schedules for the school facilities that we rent. The Spring Outdoor season typically runs from the second week of March through the second week of May (Instructional), the third week of May for Junior, Intermediate, and Senior Divisions. The dates vary by division due to the availability of the fields at each facility. There are no games on Easter Sunday and the season will end by Memorial Day weekend. The Instructional program starts in 1st and 2nd grade and there are 6 to 8 teams. Here the players learn the fundamentals of field hockey. It starts with how to hold the stick, then moves on to dribbling and passing. There are a lot of fun situation games designed to give the players a feel for teamwork that is a part of modern field hockey. By the end of the 8 weeks we have them playing full games. The Instructional program is a Sunday ONLY program held at WHS from 12 to 2pm and they typically play 6 vs 6. At the end of season, there is a round-robin Tournament where all participants receive medals. Protective eyewear is required. It is not unusual to have players start in the WRA Program at the Junior level. There are 6 to 8 teams in this division. There is ONE practice a week and one game on Sunday. The field is scaled down to match the players size (35yds x 60yds) and they typically play 6 vs 6. The WRAFH coaching staff follows a consistent program for skills and teamwork development. The real focus for this division is to get the players to not just chase after the ball but to find teammates and pass. WINNING IS NOT STRESSED OR RECORDED, POSITIVE SKILL DEVELOPMENT IS PRAISED. At the end of season there is a Tournament where the winners compete for medals. Protective eyewear is required for this division. Building on fundamentals is the theme at this age. There are 6 - 8 teams in the division and they play 6 vs 6. No record of scores is kept as we still think it is more important to challenge the players to try new things and not feel as though they jeopardized their teams by making mistakes. There is ONE practice a week and one game on Sunday. These games are fun and exciting to watch as the players are gaining more control of the skills. The real test for these players is to compete at the end of season Tournament where the winners receive medals. Protective eyewear is required for this division. This is the big leagues for the WRA. The Senior Division plays at Germantown Academy for both practices and games. There is ONE practice a week and one game on Sunday. The senior division is made up of 6 to 8 teams. Games are played on a full size field (50 yds x 100 yds) with 10 players on each side. WRAFH plays without goalies. Instead, the goal has a block placed on the goal line that is 36" wide and 18" high to add an obstacle to replicate a goalie. Rosters are made up of an even mix of 7th, 8th, 9th, 10th, and 11th graders (only non-varsity 10th and 11th graders). This age mix creates a good learning environment for the younger players to develop their skills. Unlike the other divisions, the senior division keeps track of the win/loss records for the season, which determines seeding for the tournament. The season has 7 games and a Tournament at the end. The tournament is played at Germantown Academy on full size fields. We really can’t do this without your support. If you have sponsored previously we hope that you would consider doing it again this year and if you have never sponsored, this year is a great time to join our program. The cost to sponsor a team is $200.00 and you can contact Karen Missimer (kmissimer@gmail.com) or Lauri McCallum (mcpax2011@gmail.com) if you have any questions. WRA trains high school students (MUST be in at least 9th grade) to officiate the Junior and Intermediate games and the Instructional Tournament games. You are required to attend the scheduled training session(s) and the scrimmage day in order to be placed on the active official’s roster. There are two training sessions for first year officials and one for all returning officials. The first training session will be announced and is usually held during the beginning of March. The training session for all officials is held on the first Sunday practice date (usually the second Sunday in March). The scrimmage is usually the third Sunday in March. There are a limited number of spots and registration preference is given to those that officiated in the past. To register as an official, you must have or create an account with WRA, the option to register will appear if registration is still open. The contact for the officials is Rich Fry, mrfry22@yahoo.com. Our organization is managed and coached by volunteers. Please register as a volunteer to coach. The program will be better if you donate some time, and that commitment is minimal as long as everyone pitches in! All volunteer coaches and assistant coaches age 18 or older must complete the online background check in accordance with the WRA policy described on the Background Screening page of the WRA Web site. To complete the online background check, log into your WRA account, click Register, and then choose Coach Background Checks from the menu. There is no fee for this service. Coaches must also obtain Commonwealth of Pennsylvania clearances for volunteers. Details for all background screening requirements can be found on the Background Screening tab of the main WRA webpage. All volunteer coaches and assistant coaches who are minors and/or students must, together with his/her parent/guardian, complete and submit to the appropriate Division Commissioner the Parent or Guardian Attestation for Minor/Student Volunteers (click here to view/print the document). If there is an issue that you need to disclose regarding your minor/student child, please contact Field Hockey Chairpersons Karen Missimer or Lauri McCallum to discuss. A decision will be made on an individual basis whether to exclude a student from volunteering based on the nature of the infraction and/or the amount of time since the infraction occurred. All student volunteer coaches and assistant coaches must be paired with a registered adult age 21 or older, who may or may not be a parent, and who has completed the online background check. The designated registered adult must be present with the student volunteer at all WRA practices and games. All volunteers under 21 years of age must complete and submit to the appropriate Division Commissioner the Volunteer Affirmation Form for Minors/High School Students (click here to view/print the document). Notify Teams when you are assigned your team. Coaches will have limited access to the player database and will be able to conduct team management from their personal WRAsports.org account. Work with opposing coach and Division Commissioner. For the Senior Division, both coaches should turn in scores to the commissioner by Sunday night. Communicate with your team regularly. Communicate with your commissioner when questions or issues arise. Attend one practice and/or one game each week for the season. Be a positive role model for your players and parents. We’re here for the kids.